The Glanhof multi-story housing complex in Klagenfurt, Austria, is a crystalline zig-zagging structure that integrates hundreds of photovoltaic elements. Vienna-based Architects Collective created a solar design that integrates photovoltaic panels into the street-facing facade, which helps make the building virtually energy autonomous. The complex comprises three structures housing 150 living units organized around a green courtyard. All of the 50 to 75-square-meter subsidized apartments have large balconies overlooking the courtyard. The project was conceived as a residential mix of different profiles-from families with kids and single parents to singles and the elderly. The fully-glassed ground floor features common areas such as a cafe, buggies and bicycle parking and multi-use spaces. Pivotal to the project are its impressive solar design and energy efficiency. Energy for hot water and heating is mostly generated by the rooftop solar panels, a heat pump system and a geothermal reservoir. Excess energy is stored in a geothermal brine reservoir and released when the weather turns cold. The complex comprises three structures housing 150 living units organized around a green courtyard. 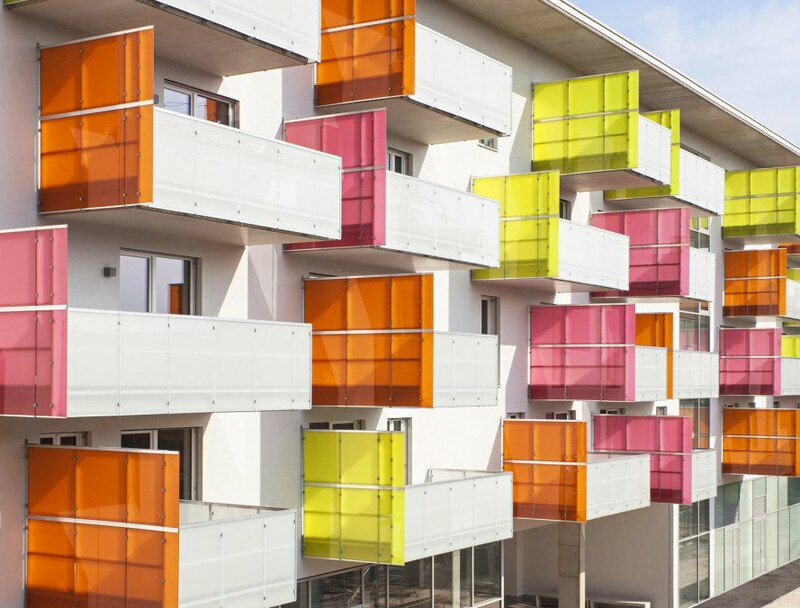 All of the 50 to 75-square-meter subsidized apartments have large balconies overlooking the courtyard. The project was conceived as a residential mix of different profiles-from families with kids and single parents to singles and the elderly. The fully-glassed ground floor features common areas such as a cafe, buggies and bicycle parking and multi-use spaces. The pivotal aspects of the project are the solar design and energy efficiency. Energy for hot water and heating is mostly generated by the solar panels on the roof, a heat pump system and a geothermal reservoir. Excess energy is stored in a geothermal brine reservoir and released during cold weather.